breeder say that he palpated a doe and thought she had missed. She later had seven babies on the wire. The moral of the story is that even an experienced breeder can miss a pregnancy. It’s not that hard to put a box in just in case. 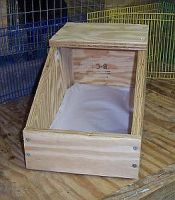 There are different types of nest boxes made from different material. One breeder may just love and have good results from a type of box you hate. I personally prefer the ones made with wire on the bottom. Except in the height of summer, I fold up unprinted newsprint and place it in the bottom of the box first (you may be able to buy an end roll of newsprint at your local newspaper office for a few dollars; I use about one per year). Then you can place nesting material in the box. My boxes are a little larger, so I like to stuff a lot of hay in the box and make an indentation in the middle back. Some does will pretty much accept the box just like I put it in the cage. Others are determined to tear out the paper (mostly does I’ve bought from other breeders who are use to other routines). Some take out all of the hay and replace it all, piece by piece. Some breeders do not build the nest for the doe, but rather place the material in the cage and allow the doe to build her own nest. I’m sure there are several different ways to handle this step, but it is important that the doe have the box and the nesting material on day 28. I have had babies born on day 29 more than once. I place the box into the doe’s cage about three days before kindling (two if I know the doe is the type to soil it or destroy it if placed too early; earlier for those does who plead with me with mouths full of hay, ready to build their nests). In cold weather, I fold several thicknesses of unprinted newsprint and place it in the bottom. In warm weather, I skip the paper. 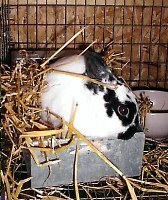 Then I fill the nest box with hay. 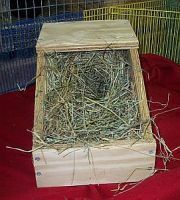 Other materials are suitable for nest boxes as well, including shavings, shredded paper, and straw. I make an indentation in the hay in the far back of the nest box to encourage the doe to make her nest in the back where the kits will be more protected from the weather and from the doe’s jumping in and out of the box. I make sure the doe has access to additional hay so that she can customize her nest before she lines her nest with fur pulled from her chest, tummy and legs. If you have a doe who tears the paper out of the nest box, just use the hay and let her make her nest. Then lift out her work of art and put the paper under afterwards. I only have one doe who tends to do this; the others never look that far under the hay. I did have a doe last summer who took out every piece of hay and carefully replaced it. I must admit, she did a much better job than I! 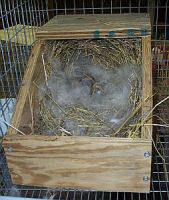 At nine days I change the nest material, saving the fur in cold weather and disposing of it in warm. I keep the hay in the front of the box low at this point, to discourage babies from wandering out before they are able to get back in. I replace the hair once the hay is changed when the weather is cold. I have found that the day or so after changing the hay is a time when babies are likely to be able to wander out of the box and freeze. So I try to keep an extra eye on the nest boxes for a couple of days after changing the hay. After that, I replace the paper, when used, and hay every few days, depending on the number of babies and how soiled/wet the hay gets. At three weeks, I remove the box altogether, at two weeks in warm weather. In very cold weather, I may provide the kits with some hay for the first few nights until they are acclimated to life without their nest box. Between litters, I wash the box (the mother will undoubtedly soil the top more than the babies do on the inside). Then we disinfect it with one part bleach and five parts water. When there is sunshine, he leaves them out to let the ultraviolet rays help with the disinfecting. We then hang them on the shed wall and wait for the next go round. The empty plywood nestbox, all clean and sanitized. A nestbox full of babies, lined with the mother’s fur.